The solar oven (also called a “solar cooker”) is a unique and fun way to cook food by converting free sunlight into heat energy! It is yet another simple sustainable living project that can be a great way for anyone to save on electricity costs (or fuel) during sunny summer months, while also lowering your ecological footprint and reducing pollution. It can be especially useful for emergencies, off-grid homesteading, and permaculture plans. 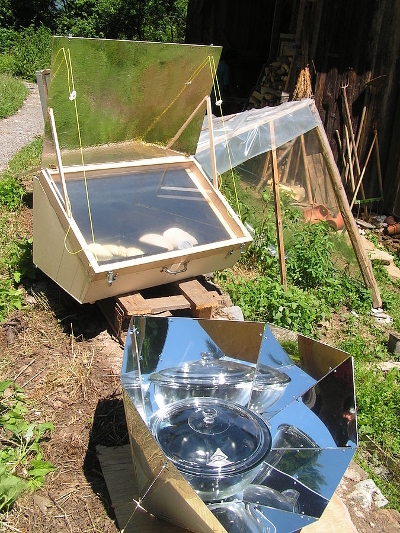 The solar oven uses the power of radiation from the sun and concentrates it in order to slow-cook all kinds of food. Arguably, this method was first invented by the Swiss physicist Horace de Saussure back in 1767, but really didn't come into use by the general public until nearly 200 years later. For starters, most solar ovens use reflected sunlight to heat up food to between 200 and 300 degrees Fahrenheit for slow cooking. It works best in the middle of bright sunny days when the temperature outside is warm or hot. It requires having a reflective, metallic surface that can be bent and/or angled to reflect sunlight to a central area that is protected from wind. 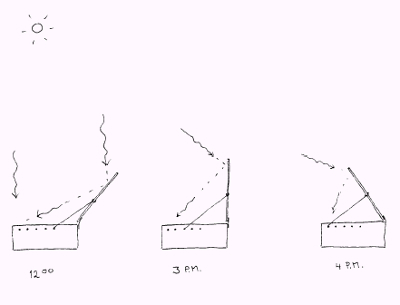 There are two common types of solar cookers: the box method and the parabola method. 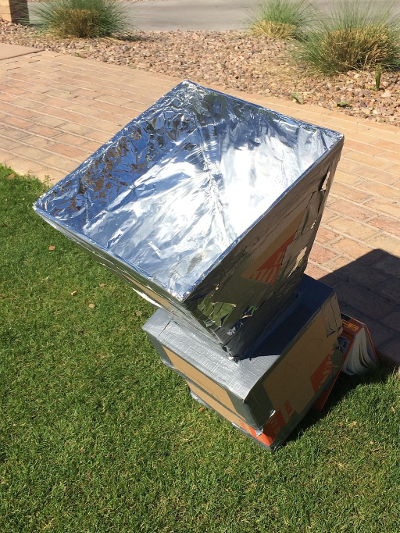 The box method or box type solar cooker can be made cheaply out of two medium-sized cardboard boxes and some aluminum foil. It usually has 1 to 4 reflective sides angled to send sunlight into the box. The box usually has a sheet of glass or clear plastic over the top to trap heat. A container with food is placed inside the box to absorb that heat. It is best if the food container is black or a dark color, because darker colors absorb more heat. The parabola method or parabolic type solar cooker uses reflective surfaces formed into a circular, parabola shape that concentrates the rays of the sun. Some folks have simply put aluminum foil over old television satellite dishes to reuse them for this purpose. The dish shape concentrates all of the solar energy into a small, single point in a similar way a satellite dish concentrates a signal. Your container with food is placed in this spot and again it is best to have a black or dark-colored container. With both designs, it is important to be able to adjust both the reflective parts and the entire structure so that you can maximize the amount of solar radiation to get the most heat. We will discuss more about how to do this easily in the next section on design. Since it is simpler and less expensive, we will focus on making a box type solar cooker. For starters, get 2 cardboard boxes of at least the following dimensions or larger: 12" x 10" x 10" (length x width X height). Also make sure to get a roll of aluminum foil and some pieces of styrofoam. You will need a piece of glass (preferred) or clear heavy-duty plastic to fit over the top of the box opening. It will also be helpful to acquire a simple oven thermometer that you can keep inside the oven so that you can read the temperature for accurate cooking. You’ll also need glue and a roll of duct tape. Measure and cut the styrofoam to line the inside of the box (on the bottom and all 4 sides). Next cut the aluminum foil to fit all of those surfaces. Take glue and coat the styrofoam and place each of the aluminum sheets on the styrofoam pieces. Gently smooth out the aluminum foil surfaces with your hand or a credit card. Once dry, stick the pieces that go on the inside the box in their appropriate places. For the piece that goes on the bottom inside the box, you may also consider covering it with black paper instead to help absorb more heat. This will serve as your oven box. Cut all the flaps off the oven box (except on one side leave about a one-inch flap remaining attached to the box). Take your second cardboard box and cut off all of the flaps. Then cut out the bottom and one of the longer sides. Take the 3-sided piece that is left and glue and fit aluminum foil over it. This will serve as your reflector. Attach your fitted piece of glass or clear plastic to the top of the oven box. You can use tape temporarily to fix the glass to the cardboard on one side and create a flap for yourself on the outside so you can easily lift the glass. If you prefer to improve this design, you could add a thin strip of cardboard around the edge of your glass making a frame. That way, you are less likely to cut yourself or to damage the glass when you bump it. Turn your oven box so that your remaining 1-inch flap is to the back side. Attach the 3-sided reflector piece you made earlier using glue and tape to the 1-inch flap. Once attached and dried, open it up and face it into the sun. Determine what angle works best and adjust it so that it maximizes the amount of light being reflected inside your solar oven. A wire or small dowels can be used to hold the reflector at the right angle. Monitor the solar oven and food inside to ensure the correct temperature is reached and maintained. A food container with a glass lid will allow you to see the food without needing to open the oven. Most foods require 2-5 hours of slow cooking in a solar oven. The solar cooker design above is very simplistic and cheaply made. You can create more elaborate ones with different materials, and many amazing designs can be found on the internet. 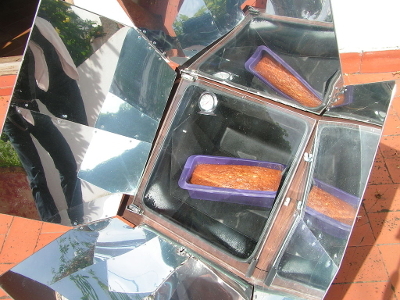 There are solar cookers made of wood, metal, and even a reflective car windshield shade! One thing to consider is what you want to be cooking in the solar oven and what kind of container it needs. Obviously given the limited size of the oven we designed above you could only put a relatively small pot or kettle inside to cook your food or heat up water. Play around with different designs and see which one you like best. Understanding the principles of how a solar oven works can even be used in emergency situations to purify water through boiling or to cook food when there is no power or gas available. The only limitation is sunlight and your imagination! 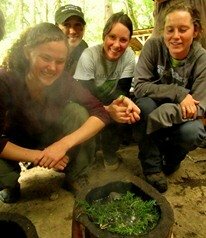 Learn sustainable living skills at Alderleaf's Permaculture Courses.